Are you considering kitchen remodeling in Mission Viejo CA? This is not a job for just any handyman or contractor. You need a kitchen design specialist such as Cabinet Magic. Cabinet Magic offers the quality construction and installation services you expect from a licensed contractor, along with excellent prices on designer products and as much or as little design assistance as you may require. When you’re just changing one aspect of your kitchen, such as your countertop or your flooring, it’s not too difficult to imagine the finished result. 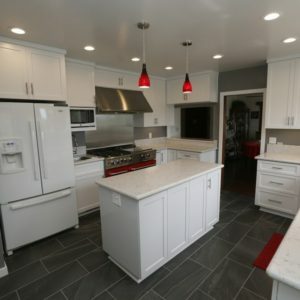 However, the more complex your kitchen remodeling in Mission Viejo CA is and the more aspects of the kitchen you change, the harder it is to really visualize what you’re getting yourself into. After all, samples can look quite different in your hand than installed in your kitchen. At Cabinet Magic, we believe being able to accurately visualize your kitchen remodeling in Mission Viejo CA before work begins is key to being satisfied with the final result. That’s why we always bring proposed kitchen designs to life using 3D rendering software. We’re happy to create multiple versions of the design so you can easily compare different options. We never begin work without your sign off and approval of every detail of the design. If you are interested in working with Cabinet Magic for your kitchen remodeling in Mission Viejo CA, please give us a call at 800-828-4380 so we can set up a free in home consultation with one of our knowledgeable team members. We can help you price the upgrades you want and give you a free estimate.